So I have been trying to put this post together for a month already now but every time I start I seem to amble off onto something else which is a royal pain considering how much I love this range guys. I have mentioned my skin issues many times over my time as a blogger and for the most part since having my hysterectomy my skin has done a complete turnaround to the point where for the first time in many a year I am happy with my skin. Then 3 months back I started to notice a change in my skin and my hair actually but let’s focus on skin for now, my skin has always been dry bar my t zone but of late it has gone full throttle and the dryness has increased and I have also started getting breakouts in my chin area. I have been incredibly lazy with skin care over the past year so I decided it was time to climb back on the horse and find a regime I love, I popped in at Dischem and perused their skin care isle for a good 40 minutes and I left begrudgingly with a face wash that I wasn’t all too happy about, seriously the entire isle was a mass of tested on animals, paraben laden products even the one range which claimed to be all natural wasn’t and they no longer stock the Essence skin care range I used to use so I had to make do, but after 2 weeks I could not use the product any longer it only worsened the issues I was experiencing and my skin was dry and painful. Then whilst browsing in Clicks a few days later the Oh So Heavenly skin care range caught my eye, I did not know that they had a skin care range and I knew that it was a range I had to try. I picked up a gel wash, spa mask/wash and moisturiser and it was a 3 for 2 special so I believe I paid less than 200 for all 3 products, I have been using it for 2 months now and I could not be happier, my skin feels more hydrated, my skin is smoother and the breakouts have all but dissipated apart from being sick now the last few days which has brought out one or 2 spots but I have found that the moisturiser is amazing for use on what is now an incredibly sensitive nasal area thanks to my flu whereas before I found any product used at this time would have burned and hurt terribly. I use the mask twice a week and the wash every day as well as the moisturisor, the mask doubles up as an scrub (exfoliant) as well which I find works incredibly well for my skin. I highly recommend that you try this range whatever your skin type, the product is cruelty free and inexpensive as far as skin care goes. The range I tried is the Beautifully Balanced range which to me seemed to be the most all rounded product range they had on offer, I am dying to try the day and night cream and will pop in to purchase those in the coming month. 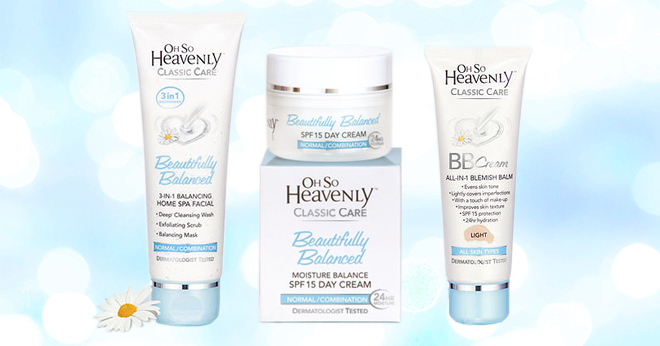 Thank you Oh So Heavenly your products never fail to amaze me.